Back in 2002, the first issue of the short-lived magazine The Ukulele Occasional was published, and in it I had a short piece on Les Paul, widely associated with the development of multi-track recording and of the solid-body electric guitar. At the time, I was living in New Orleans, and he was playing weekly at a club in Manhattan, even though he was nearing age 90. I’d interviewed Les Paul once before, and was hankering for a reason to speak with him again when I stumbled on a bit of history I wanted to flesh out. The magazine was founded by Jason Verlinde, an old colleague from my Tower Records Pulse! magazine days, who went on to found The Fretboard Journal. The two times I interviewed Les Paul, I was hunting for something that likely never existed. I dreamed that in his multi-track experimentation he had recorded things that were closer to noise music than the accomplished, jazz-tinged pop for which he is best known. Maybe such tapes are buried deep in his archives. But no matter. Speaking with him was always a pleasure. He passed away in 2009. It was a historic moment, in retrospect, certainly worth a phone call to clarify details. In 1944, according to various discographies, three songs were committed to tape by Cliff “Ukulele Ike”Edwards. Backing him on these songs was said to be guitarist Les Paul. How did it happen that this unlikely pair would cross paths? In 1944, the United States was at war ”“ a not insignificant factor in this anecdote, it would turn out. Almost three decades would pass before Edward’s death, but by many measures his career had already peaked. The ukulele was fading from popularity, and the film in which he performed his best-known role, as Jiminy Cricket in Walt Disney’s Pinocchio, was released in 1940. Les Paul is a masterful player and, famously, the man who perfected the application of multitrack recording to pop music ”“ but, all the more important in this instance, he was the man who brought about the solid-body electric guitar. Politics junkies may savor such change images as the uniquely opportune photo of a young William Jefferson Clinton shaking hands with President John F. Kennedy, but this meeting between Edwards (1895- 1971) and Paul (two decades his junior) was truly one of past and future ”“ between the popular master of a small, utilitarian, hollow-bodied, four-string novelty item and the entrepreneurial artist and inventor who jettisoned the hallowed resonance of a wooden cavity in favor of pure electricity. Today, Les Paul performs weekly at a club in Manhattan. His memory is sharp, and he loves to regale audiences with tales of the early days of radio, and of his legendary recording partners and peers. When he got on the phone with us in early May 2002, he was prepared, having tried in advance to recollect his brief association with Edwards. And what he remembered was a hot dog. The Ukulele Occasional: I trust you were informed, in advance of this call, that I’m looking into some 1944 recordings you reportedly did with Cliff Edwards, known in his day, of course, as the performer Ukulele Ike. Les Paul: I didn’t record with Cliff, and it wasn’t 1944. It was 1939. I didn’t record with him at all. What happened was, I ended up riding with LaGuardia down Broadway in a parade ”“ with Ukulele Ike and [Fiorello] La Guardia. For whatever reason, we ended up at Coney Island, and Cliff and I were honored with a hot dog, purchased by LaGuardia for us. And I’ve never forgotten it, because how many people have that privilege, for someone to say, Would you like a hotdog, a Coney Island hotdog, and a cob of corn, and we went over and he got it for both of us. This was Mayor La Guardia. Of course, I knew Cliff well, but that’s the only experience I had with him [personally], was to ride in a limo with him down Broadway in 1939. UO: Well, I’ve found, perhaps mistakenly, reference to three songs released on the Totem record label, with you backing Edwards up on guitar in 1944. LP: I don’t even have them. Have you heard them? UO: No, I’ve been trying to track them down. LP: That’s what it is, because I was in the Armed Forces, and I played for everybody. That’s so strange, because we [the Les Paul Trio] played for so many ”“ I didn’t even think of it. One day, you could play for 30 different big name artists. UO: They’d come through the studio and you’d back them up? LP: That’s right. It could be Kate Smith, it could be Ukulele Ike, it could be Art Tatum. We just never knew what was on the schedule. When I was in the Armed Forces you’d get a schedule, and it would say, Be here at that time. I’d be at NBC at two o’clock, and it would say Kate Smith, or Bing Crosby, or whoever. You’d just do it. Or, he may have been on one of the shows, like Mail Call Jubilee. I’m trying to track that stuff down now. It’s real hard to go into the Armed Forces, especially to find pictures. UO: Were the sessions filmed as well? LP: Not filmed, but there’s always someone from the Armed Forces, and the artists themselves would have their publicist people with them. If I’m working with Kate Smith, there would be a photographer shooting pictures, but not so much motion pictures. I got all the work you could imagine, because it fit everyone. If Kate Smith was doing something, why they’d say let’s go over and play for her. We’d play for everybody. If it was Benny Goodman, why he’d come in and he’d have a quartet. Away you’d go. UO: So, aside from this Armed Forces session, the 1939 parade would be the only time you’d met Edwards? LP: That was the only time ”“ the first time I met him. That was the one I was thinking you were talking about. UO: Did you speak with him at length, or was it a lot of waving? LP: It was a lot of waving, and perhaps we did a lot of talking, but it wasn’t about the stage, although I had seen him on the stage. Do you have any research on a parade down Broadway? UO: That’s what’s next for me, I suppose, and if I find a recording of those three songs, I’ll send you a tape. LP: Oh, I would love that. I was with Fred Waring [in 1939], and the only reason I could rationalize that I got with Ukulele Ike on that ride was the fact that Fred Waring couldn’t make it. So, he sent me instead. I loved working with Fred, and when they’d want some entertainment at the Lambs Club or whatever ”“ well, Fred Waring don’t want to be bothered with that, so he’d say, “Well, I got something for you to do.”And we’d go over and do it. And there would be many times when we’d do these ”“ do something that, uh, Fred Waring just had something other to do instead. UO: From what I’ve read, Waring sounds like a real taskmaster, running a vast performance space where he could check in on all the individual rehearsal rooms. LP: [Laughs.] He was a great man to work for. A tough man, but a great person to learn from. Fred Waring was a tremendous showman. 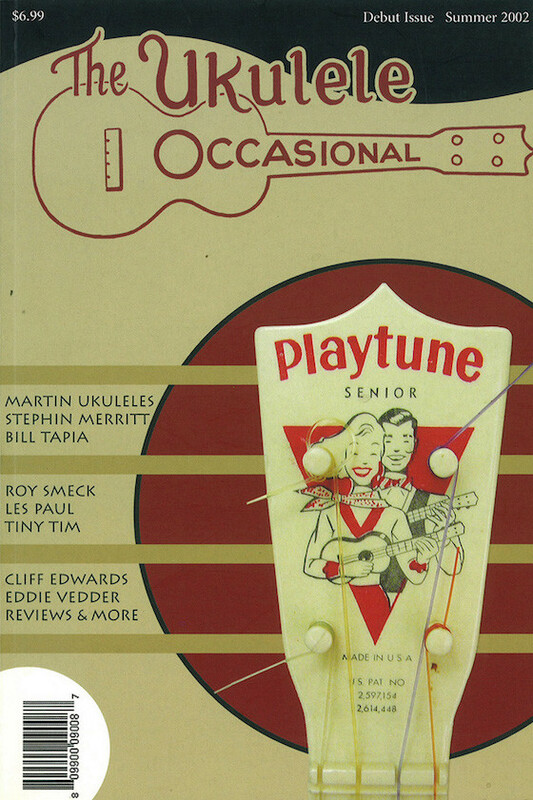 UO: The reason I was interested in your meeting Cliff Edwards is that I was focused on the idea that this person, you, who brought about the solid-body guitar, recorded at some point with this guy who was one of the last vestiges of the ukulele craze ”“ to me, that was so fascinating a historic moment to go uninvestigated. LP: I listened to a lot of the old-time radio broadcasts, where they’d play a lot of Ukulele Ike, because it’s interesting how far back he went. He went back to the beginning of recording. I presume he started with Edison. UO: Yeah, because he would have been around the same time as another ukulele great, Roy Smeck. LP: Yeah, Roy Smeck. I knew Roy real well. Didn’t record with him, but we played together many times. UO: What was he like as a person? LP: [Laughs] At the time, he was trying to get away from his wife, and he ran off to Brazil at one time. I’d hold his hand through many a time of jamming and talking. The last time I played with Roy Smeck was on the lawn, Edison’s lawn, at the 100th anniversary of the phonograph, and I was the emcee, and I did my shtick, and introduced all the different people, some of the great great artists at the beginning of recording, like Eubie Blake. I believe this was about, I would say, I would guess it was the early ”˜70’s. UO: Edwards passed away in ”˜71. LP: No, he didn’t make it. Smeck did. Eubie Blake was [about] 100 at the time, and he had both of them, Roy Smeck and Eubie Blake, who had arthritis real bad. So, I got to play with both of them, and that was the last time. Then Roy died, and so did Blake. Ukulele Ike, what I liked about him was he sang really good and he had good background; he used Eddie Lang a lot. I really liked him, even though it was that one day we got to know each other. UO: So, you don’t remember what the parade was for? LP: No, and I wracked my brain, and I know I gotta do some research. All I know is, I got the hotdog, and I know La Guardia was a great privilege to be with. Special thanks to Nick Drexler (twitter.com/nickdrexler) for transcribing from the original magazine. This post was uploaded to Disquiet.com on June 27, 2015, but backdated to mid-2002 to match the original publication date.